The exhibition is drawn from the Jean S. and Frederic A. Sharf collection -- one of the largest collections of its kind in the world. In addition to the sixty-one woodblock prints and Emperor Meiji scroll from the Sharf collection, the exhibition also consists of fourteen woodblock prints of the earlier Edo period, from the University's own collection. Imaging Meiji was originally organized by the Cantor Fitzgerald Gallery, Haverford College. Kenji Hayao, Associate Professor of Political Science, Boston College and Victoria Weston, Assistant Professor of Art History, University of Massachusetts, Boston served as curators for the expanded version at the McMullen Museum of Art. The reign of Emperor Meiji (1868-1912) initiated one of the most dramatic and far-reaching transformations any nation has ever undertaken. During the prior Tokugawa period, from the early 1600s until the mid-1800s, Japan had existed within a bubble: it was a feudal, pre-industrial society that had had very little contact with the outside world. In 1853, on orders from President Millard Fillmore, Commodore Matthew C. Perry sailed his flotilla of U.S. Navy warships into Edo Bay (present-day Tokyo Bay) to burst this bubble and force Japan to its isolation. The resulting crisis led to new Japanese leadership and an unprecedented modernization drive. By the turn of the century, this small, isolated country in the Asian backwater had grown into a global imperial power. The woodblocks prints in this exhibition provide a popular, contemporaneous view of Japan during the nineteenth century, both before and after the West made its impact. 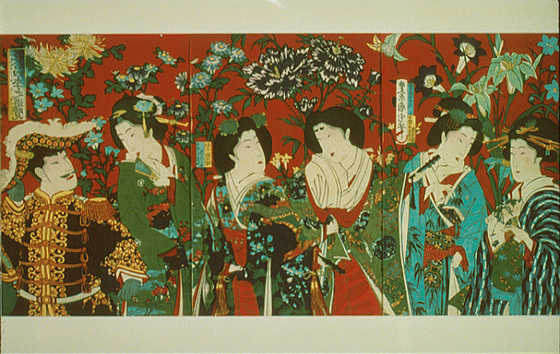 Woodblock prints first became popular during the late seventeenth century, and they remained a mass-produced art form through the nineteenth century. The prints in the first room, drawn from Boston College's James W. Morrissey Memorial Collection, reflect life during the rule of the Tokugawa Shogunate just prior to Japanís opening. These describe the relative peace and stability of a world that was as yet quite untouched by Western influence. The several rooms following illustrate a very different Japan. These depict the people, places, and events of Japan's transformation under Emperor Meiji's reign. Drawn from the extensive collection of Jean S. and Frederic A. Sharf, these prints, photographs, and hanging picture scroll capture the momentous events of the period. In the drive to modernize, the Japanese adopted and adapted Western ideas, technologies, and institutions; they reinvented their traditions to fit the new age; and they radically changed the ways in which they dressed, lived, and worked.